As usual, just a round-up of random cool things that don't fit in any other way with my blog, but might be of use or interest to you (or can get me cool free stuff). Stick around to the end. There's a video of Fury doing a DVD review. I'm gonna make 4 people the envy of Star Wars geeks everywhere in 20 years (it's not derogatory when you're one yourself. Whut up mah 'wars geek!) -- unless they defile open these and give them to the kiddos, in which case they will just create more crap to pick up when playtime's over. Not my problem. I offered you the red pill. I hate the whole diet supplement industry. Yeah, so this metabolism-boosting fat blocker pill will totally work if you also happen to run 6 miles a day and eat sensible meals (for a dwarf hamster). Stop insulting my intelligence (not saying I have a lot of it, just that it's insultable). So when the people at Sensa emailed me, I was ready to lay it on them. But they didn't come at me with claims. They came with balls. "Try it on us for 6 months and chart your progress, good or bad." (paraphrasing). Simple as that. Hmm. A throwdown of sorts. Since d Wife is perpetually looking to lose 15 pounds (she said it, not me! ), I asked her if she wanted to try it out. She agreed. And here we are. A little bit about Sensa (it's the least I could do to reward a smart PR strategy). This product was invented by Dr. Alan Hirsch, a neurologist who has spent his career researching smell and taste. In one of his research studies he noticed that many patients who had lost their sense of taste due to head injuries tended to gain weight. Long story short, there's a portion of the brain called the "satiety center" that controls our urge to eat. The more it's stimulated (or satiated, I guess), the less you feel like eating. 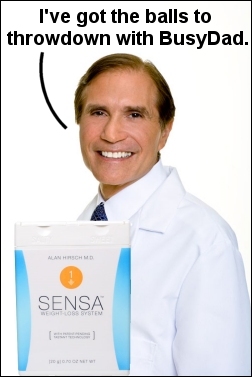 Sensa is simply a non-caloric "tastant" - or magic crystals as I like to call them - that you sprinkle on your food that triggers the part of your brain that suppresses your urge to eat. No need to change your diet or get off the couch. You simply eat less and therefore lose weight. d Wife has been sprinkling it in her food for a few days now and for the next few months, I'll be checking in and letting you all know how she's faring. Funny, I tried it on my spaghetti the other day and it made me eat more. I'm such a party pooper. Starting off strong in the opening round there, Dr. Hirsch. You are a worthy opponent. By the way, if any of you want to try it, they hooked us up with a discount code to get 15% off your order and free ground shipping. Just go to TrySensa.com and use the code ROCKETXL when you checkout. I love a good tattoo. And that's why a good portion of my upper body is inked. But in all my years of submitting to the needle, I can't say that my tattoos have been very useful. Sure, they're badass and all, but if I were to get lost one day and a nice old lady found me, how would they help get me back home? I totally need SafetyTats. 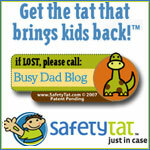 The guys at SafetyTats took a biker tradition and turned it into a useful child-safety aid. Only in America, folks. Check out the site. I love admiring cool ideas that I didn't think of. Seething jealousy aside, I have to admit, these are pretty useful. You can put your cell phone number on them, so if you happen to get separated at Disney World or trick-or-treating, people will know how to get in touch with you (just tell your kid not to go with telemarketers, even if they were just "in your area" at the time). Or if they have special medical needs or food allergies ("this kid will spit on you if you feed him tomatoes"), you can slap one of these on as a warning label of sorts. And you know your kid won't fight you on it. It's a freakin' tattoo, dude! Remember when you could ONLY catch cool cartoons on Saturday morning? Like literally, all that was on TV on Sunday morning was Barbapapa, Captain Bob (boy he could draw a mean swordfish!) and Davey and Goliath? I'm not going anywhere with this. I was just asking if you remembered. Because if you do, you remember that catchy Schoolhouse Rock tune "I'm Just a Bill." 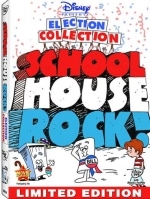 I don't remember too much else about Schoolhouse Rock - just that I liked it, and it was way better than that boring "In the News" segment they played between CBS cartoons. Well it all came back to me a few days ago because I now have the DVD . And nearly 30 years later, it STILL rocks. If you grew up in the 70s and 80s, you MUST get this DVD. Watching it with Fury made me want to pee, because back then, they always stuck the videos between cartoons, thus preventing me from taking my pee breaks. But more amazing than that (way to set that amazement bar, BD) is the fact that despite its hand-drawn, old school cartoon style, Fury also loved it. This special edition DVD compiles a bunch of election and history-themed songs, fitting for this election season. After watching "No More Kings," "Shot Heard 'Round the World," and "Three-Ring Government" I reaffirmed my belief that old school is simply better. My NYC Trip. Mad Libs Style.